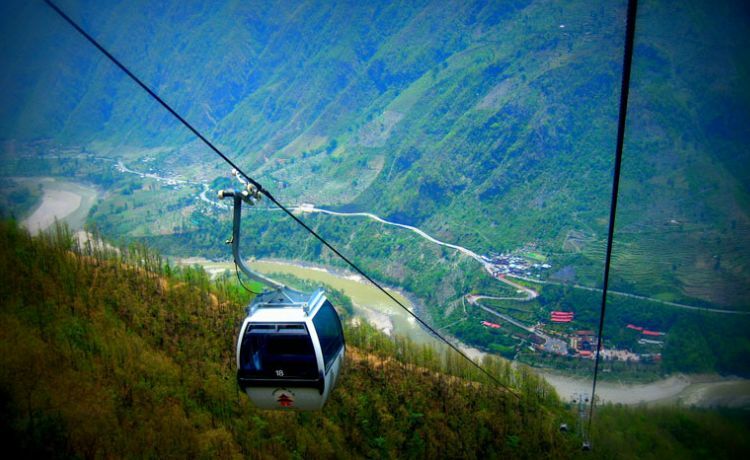 Newly introduced, the spiritual adventure from the ridge of hills, linked up the highway, the river on its base from Kurintar to the famous Hindu temple, dedicated to wish fulfilling Goddess Manakamana is not less than Switzerland riding cable cars. The hill top (1,302 m) is also the viewpoint for the Manaslu and Annapurna massifs to the north. Manakamana is located south of the historic town of Gorkha and 6 km north from Mugling, the famous highway junction to go to the east, Pokhara. The distance between Manakamana and the starting point is 2.8 km. It takes 8 minutes to cover the distance. There are 34 boxes, among them 31 are for the passengers and 3 for the cargo. Each car has 6 persons capacity to carry at a time. The system has capacity of handling 600 persons per hour. This was made under Austrian technology and it has benefitted people a lot. It is 87 km from Kathmandu to Kuringhat where there is cable car, takes 3 hours by bus. Manakamana is the gateway to the newly explored trekking route to Lower Manaslu. You will find much ethnic-cultural diversity en route to Manaslu. The hilly region is rich in natural, historical and cultural point of view. Day 01:Drive from Kathmandu to Kurintar, 3.5 hrs, Cable Car ride to Manakamana, return back to Kathmandu. Day 01Drive from Kathmandu to Kurintar, 3.5 hrs, Cable Car ride to Manakamana, return back to Kathmandu.After breakfast, we can conveniently drive to Kurintar about 85 km west from Kathmandu. It takes about 3 and half an hour by car/van.After we get down from Thankot, Kathmandu, the countryside, terraced farmlands and village houses are spectacular. We keep on going through Prithivi Highway passing, Mahadevbenshi, Belkhu, Gajuri, and reach to Kurintar where there is beautiful gate in the right hand side. A little further down we go , there is cable car station, built in Austrian technology. We get ticket in the counter and go to the top of the hill viewing pine forest, river and finally to the top in the Manakamana temple. It is the powerful wish fulfilling goddess revered by Hindus. We can view the series of mountains from the temple premises. After exploring Manakamana, we return back Kurintar by the same ticket and drive back to Kathmandu.